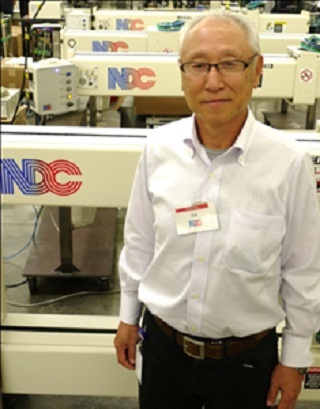 IRWINDALE, CA, November 15th 2013 – (www.ndc.com) – NDC Infrared Engineering is pleased to announce the expansion of its Japan operations through the appointment of Teruo Horino as Sales Manager, Japan for its Web Gauging and Metals systems. Horino-san brings many years of experience in industrial measurement and control systems across a wide range of applications including power, energy, web gauging and industrial automation. Horino-san earned a degree in electrical engineering from Sophia University, Tokyo, Japan before becoming an instrument engineer for IHI in their power boiler division. Following this, Horino–san has held a number of sales management positions at well-known companies such as Foxboro, Japan Energy, Measurex and Honeywell in their automation and web gauging divisions. About NDC – NDC Infrared Engineering offers the world’s most extensive range of non-contact sensors and systems for measurement of moisture, fat, and other constituents in tobacco, food and bulk products, basis weight and thickness in continuous web processes, and thickness, flatness and width in metal sheet goods.The metals product line includes X-Ray and optical thickness gauges, laser-based flatness and width gauges and a range of XRF sensors to measure coating thickness. The group’s range of measurement technologies for the web industry includes infrared absorption, beta transmission, gamma backscatter, X-ray backscatter and transmission, optical and laser caliper. Applications include film and sheet extrusion, paper, foil and film converting, nonwovens, and rubber sheet manufacture. Products range from fixed-point low-cost devices for QA checks, to complete on-line system solutions for continuous precision measurement and process control. The group is the world market leader in the design and manufacture of near infrared (NIR) sensors and systems for on-line and off-line analysis and measurement. The NIR product range includes instruments for monitoring fat, moisture and protein content in food; moisture, nicotine and total reducing sugars in tobacco products; film thickness, barrier layers and coat-weight in plastics; paper and board, foils and sheet steel. NDC Infrared Engineering is headquartered at Irwindale, CA in the USA and Maldon, UK and Alleur, Belgium in Europe. Operating companies in Germany, Italy, China, Japan and India provide local support to key world markets, and NDC Infrared Group is presented in more than 60 countries worldwide by a network of specialist distributors.NDC Infrared Engineering is a Spectris company, an international company specializing in high value-in-use process control solutions.